Daytonian in Manhattan: The 1894 Church Missions House -- No. 281 Park Avenue So. The 1894 Church Missions House -- No. 281 Park Avenue So. The glowing account from the opposite side of the country foreshadowed a magnificent structure the beginnings of which went back decades. The church’s Domestic and Foreign Missionary Society was founded in 1821 to coordinate missionary activities in the western states. Later the efforts of the society would turn to Africa and China. In 1835 the society moved from Philadelphia to New York and in 1864 the idea of a permanent church missions house first arose. Not until 1888, though, would serious action be taken. A committee was organized to collect funds and secure a location. Among the members were six laymen and the society chose well; included were W. Bayard Cutting, William G. Low and Cornelius Vanderbilt. With their significant clout the men helped amass sufficient funds to purchase the plot and to begin construction. Cornelius Vanderbilt personally gave $50,000 toward the building fund and J. Pierpont Morgan donated a portion of the real estate. The site ultimately chosen was the southeast corner of Fourth Avenue (later renamed Park Avenue South) and 22nd Street, directly across the street from the hulking United Charities Building. Architect Robert W. Gibson was given the task of choosing the winning design—that of Edward Stent which was made public in December of that year. 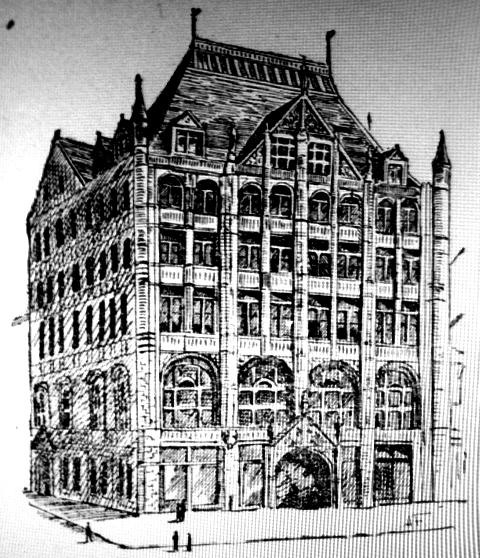 Stent’s original plans were subsequently altered and enlarged and by 1892 when the cornerstone was laid Stent and Gibson had collaborated on the final design. In its presentation the committee predicted the cost of the structure to be around $200,000 including the land. The men grossly underestimated their vision. 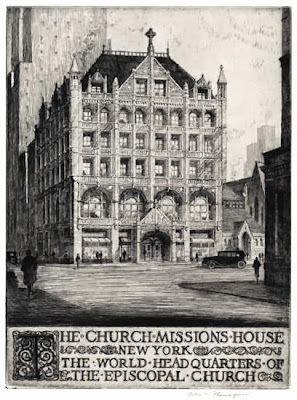 Now comfortably ensconced in its glorious new home, the various groups comprising the Missionary Society could get on with their work. On May 8, 1900 the New-York Tribune reported on once such outreach—this one quite close to home. The group kept constant pressure on legislators and inspectors for years. In 1902, while the sweatshop conference was in session, New York saloons lured working men with their famous free lunches. The Women’s Auxiliary of the Church Temperance Society came up with a solution—lunch wagons. For ten cents workers could get a hot meal without being seduced into the wicked environments of a saloon. Other vans were sent out in cold weather with insulated tanks of steaming coffee for motormen of the omnibuses; and they stopped by the scenes of fires as well, providing fire fighters with hot coffee in the winter. The proposal, which was publicized on September 30, 1902, never came to pass. Thankfully. Debutante Ethel J. Wheeler shocked some New Yorkers in July 1908. A headline in the New-York Daily Tribune on July 21 read, “Miss Wheeler Renounces Social Life for Work at Wuchong.” Ethel was among the 32 outgoing missionaries heading to China. “The news of her decision to become a missionary came as a surprise to her friends,” said the newspaper. She had traveled widely through Europe, had studied art, and was a member of the Art Students’ League. Hers was not the sort of life decision one expected from a wealthy, well bred young woman. “She will defray her own expenses and means to devote her money as well as her time to the work,” reported the Tribune. Not all the churchmen were as enthusiastic about the missionary work among the Chinese. A conference in the building on September 23, 1919, “brought out some opposition to the extension of the work to the Chinese,” reported The Sun. Some clergymen saw more important missions to tackle. “A lively discussion was precipitated over the problem of establishing missions for the Christianizing of Jews,” said the newspaper. In 1926 the National Council of the Episcopal Church turned its attention toward a different issue: birth control. Congress was considering an amendment to the Federal penal code and Tariff act that would make lawful the sending of contraception items through the mails. The structure became home to the Federal of Protestant Welfare Agencies which, in 1991, initiated a major restoration and renovation program. The architectural firm of Kappell & Kostow were given the commission that included resurrecting and restoring the mosaic marble floors that had been covered with vinyl tiles; removing dropped ceilings to re-expose the plaster-ornamented ceilings, repairing the copper and terra cotta roof; restoring the leaded, stained glass windows; and bringing back to its former appearance the wooden wainscoting, doors and trims. The restoration, costing about $5.5 million, reclaimed the remarkable building that still commands attention. A tad ill-proportioned and gaudy, perhaps, but I've always been drawn to this building. Thanks for the post. 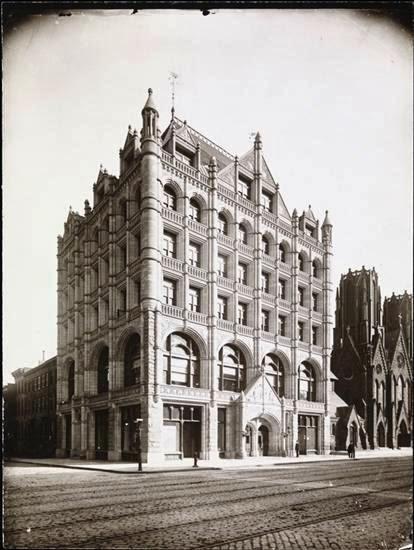 I bought the New York 1890 book and most of Wall St during the 1880s looked liked this building. White or brown Romanesque mid rise buildings with expansive windows. They are not missed.